Pros and cons with bread and butter model boat building method – aka laminated hull construction – it's a quick and easy model boat hull building method suitable for static and RC scale model boats. Bread and butter model boat construction is where the bread symbolizes the lumber and the glue is the butter in a laminated stack. The method seems to have fallen out of favor for some reason. To my knowledge there are no kits that are based on this hull construction, so consider this article aimed scratch building, as an alternative to the more common plank-on-bulkhead method. A laminated hull ready for carving to commence. Bread and Butter construction is not that different from carving a model boat hull from a solid block of wood. If anything, it's easier. Model ships that will be painted – scale model subjects that were built from steel, fiberglass or from wood and painted. A sailing yacht hull will always come out heavy when built Bread and Butter compared to fiberglass or strip planked. Casual pond cruisers may be fine, but if you are racing to win, be aware you are leaning harder on your skill if you stick with B&B. Planing hull boats, launches, racing boats, cabin cruisers, motor torpedo boats, deep vee's etc – consider sheet planked or fiberglass hulls to keep the weight down. Historic sailing ships with exposed planking – these ships are typically built with one of the built-up methods. However, it is entirely possible to plank a B&B hull in a similar manner as a plank-on-frame or plank-on-bulkhead model boat if you are so inclined. The Bread and Butter method is more economical than carving from a solid block. 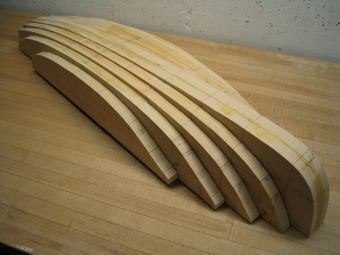 Bread and Butter is suitable for larger boat models that would be impractical to carve from a solid piece. A Bread and Butter boat model is also dimensionally more stable. Large solid blocks are more sensitive to changes in humidity, leading to checks and cracks. Lumber sizes readily available can be used with less waste. As the block is glued up, the contours of the waterlines or buttocks are helpful guides for the shaping of the hull. This makes it a lot less intimidating getting started. A rectangular block of wood can look daunting, especially to a beginner. The dull task of cutting out and shaping multiple frames or bulkheads is eliminated. Shaping the laminates for the B&B is a lot quicker and less precise. Bread and cutter is a faster building method measured from cutting out the laminate pieces to having a sanded smooth hull. You’ll spend infinitely less time waiting for glue to dry. Bread and Butter caters to a lower skill level than a planked hull. Sawing, carving and sanding is a lot more muscle than skill compared to shaping frames and fitting planks. Much of the muscle can be overcome by using power tools like angle grinders and power drills with drum sanding and flap disc attachments. Here are three different methods to build a bread and butter model boat. First, if you are not yet familiar with ship plans, follow the link. Study the description on waterlines and buttock lines. To get started, you need a ship plan of the boat you are building, with cross sections. Scale the drawing to fit your lumber. This is likely to result in an obscure scale. This isn’t necessarily as bad as some would think. It may be inconvenient if you plan on using off-the-shelf parts and fittings. If you decide to go this route, investigate ahead of time what you may have to make from scratch. If you are tooled up with a powered planer or jointer, I’d say this is a viable option. This method may be wasteful in terms of material. But as I said, if this option is available – consider it. This is not as hard as it may sound. You need a ship plan with a body plan (also known as hull sections). This is probably the more common of the three methods. It is based on the lumber being glued up in a horizontal fashion resulting in the boards laying parallel with the waterline. The design waterline (DWL) is commonly used as the reference plane. In the body plan, draw new waterlines parallel to the DWL at a distance equal to the lumber thickness you are using. Plot the intersections on the <b>waterline plan</b> or directly on your lumber. Connect the dots using a batten or French curves. The lumber should be prepared by having the center line and stations marked in pencil. It is essential for the lamination process to be successful. Building a bread and butter hull using the waterline method may seem more intuitive and will probably require fewer layers. I have a hard time thinking of any other benefits over the buttocks method. As seen on the ship plans, buttocks are the lines representing vertical slices parallel to the ship’s center-line. The centerline will be the reference line. In the same manner as described previously: draw new buttock lines parallel to the centerline spaced apart a distance equal to your lumber thickness and plot them on the shear plan or directly on your lumber etc. Follow the same idea as described before. Building a B&B hull on the buttocks has a few advantages. This method will typically require more layers than building it on the waterlines since most hulls are wider than they are tall. However, almost all hulls are symmetrical down the center. By making two of each laminate at the same time, the transferring and cutting can actually be reduced. Glue joints will aid when checking the hull shape from side-to-side. For hulls with tumblehome (where the widest part of the hull is not at the shear), creating the lifts from the buttocks is the only viable option unless you are an expert. If you consider yourself an expert, save some serious time by trying the "other way".